Citroen used the historic Retromobile event to celebrate its 100th anniversary in a big way. 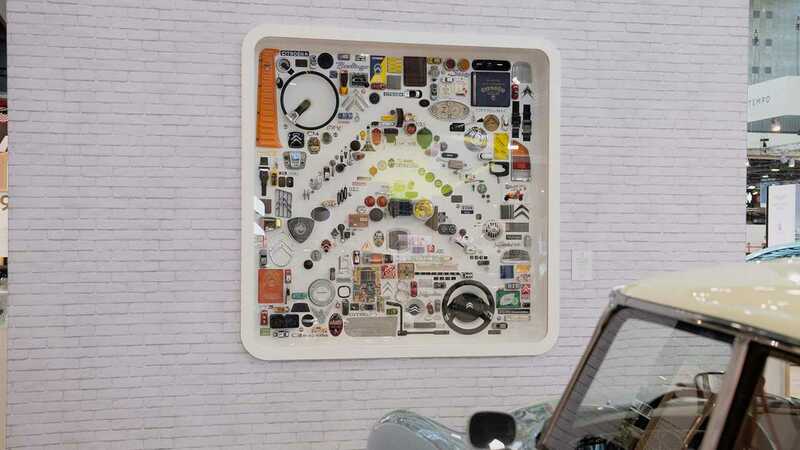 In addition to the French marque displaying 30 iconic vehicles from the past ten decades, it also presented a unique art work in the form of a collage. The ingenious piece was created by artist Jean-Baptiste Senequier, who spent six months creating ‘Made with Icons’. 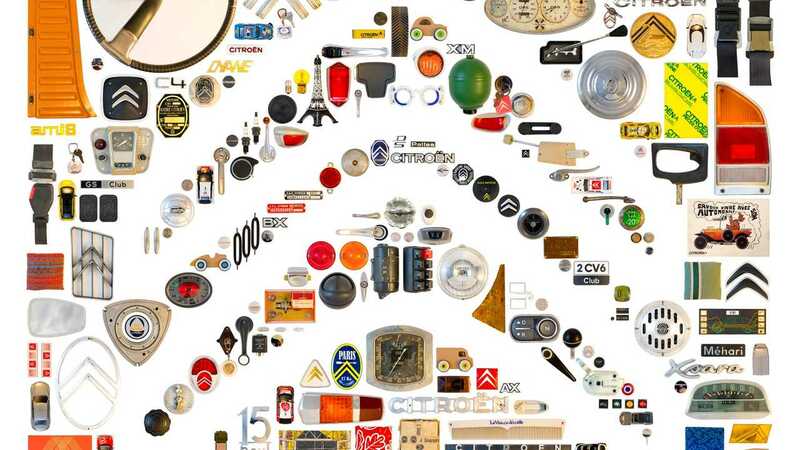 The artwork that depicts Citroen’s famed Chevron logo is made from over 263 parts pinched from historic models. This wall-mounted monument to Citroen’s past is a car-geek’s dream, providing near endless ‘can you guess which car this part is from’ fun. The cars that donated their parts are as diverse as the French brand itself with lights from legends such as the 2CV to the mesmerising ‘fix-hub’ steering wheel of the C4 Picasso. You’ll also fins parts from a Citroen DS, GS, AMI8, CX, C2, C4 Cactus, and even windscreen bolts from a 5HP Trèfle. There are also numerous incarnations of the Citroen Chevrons through the piece which clearly shows the evolution of the marque. The longer you stare at the collage, the more brilliant little details you find — we’ve only just spotted the Mehari nameplate from Citroen’s distinctive ABS plastic bodied model. The only non-genuine part used is the ‘8’ logo that represents the Citroen Traction 22, a model that was presented before World War II but never put into production. This component is a recreation due to the extreme rarity of the real thing. This impressive 3D piece of art was displayed on Citroen’s centennial stand at Retromobile 2019. It was in good company with vehicles such as a Type A, DS 21 Pallas, ZX Rally-Raid, and the Xanae concept car — the design that ultimately became the popular Picasso MPV. In all, 30 vehicles representing production, concept, and motorsport vehicles populated the stage.